Written by: Angelica Little. Read more from Angelica HERE. “Who do you even call when the cops are the ones being the bad guys? Who do you even beg to protect you?” At the intersection of social media and social justice is an audience to publicly broadcast the wrongdoings of a corrupt police system and the young black lives murdered because of it. 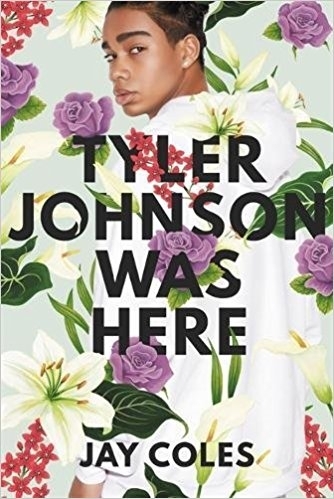 In Jay Coles’ Tyler Johnson was here, Marvin follows his twin brother, Tyler, to a party that erupts into a police raid that concludes with a murder and missing brother. Marvin’s raw emotions are heartbreaking as he pieces his life back together following the fateful night. His stages of grief are erratic as he navigates through the world that took his brother away. As he scrolls through musings of social media users who mourn and chastise his brother alike, the public defamation of an innocent boy is at the mercy of strangers. Sometimes tears flow for the words he cannot find, but he seeks action for his brother’s wrongful death while rightfully questioning the unforgiving world before him. While timeless for its subject matter, Coles’ debut has room for improvement. With the exception of loved ones, challenges read very Marvin Johnson versus the world. He is constantly hounded and belittled by a principal who lacks compassion and it comes off forced and detached from the story’s flow. Pacing is often inconsistent which can lead to an urgency to reach a turning point and resume a steady flow of action. At 22 Coles’ debut is a solid addition to any shelf. Readers old and young can relate and witness the strength social media can supplement to movements such as Black Lives Matter. He still has much to learn, but Marvin’s story teaches us all that we can return from the darkness in triumph and heal from hurt in positive ways. Are you a publicist or agent interesting in having your client’s book reviewed? Please email us at hello@permissiontowrite.com. JOIN THE MONTHLY PTW NEWSLETTER FOR UPDATES ON WRITING OPPORTUNITIES, INSIGHT ON CAREER AND CRAFT AND MUCH MORE!